Trees are known to have exceedingly long-life spans. They are the longest living organisms on earth. Mankind realized long ago that trees offer a multitude of benefits. Thus, the practice of tree felling was born. You may wonder what it means to fell a tree. Felling a tree simply translates to cutting it down. Tree felling was created as a method to use a tree for timber to construct houses, barns and other structures made of wood. Before electric and gas heating became prevalent, trees were used to create logs as a main source of heating by igniting them. Nowadays, populations are much denser than in the earlier days of mankind. The world is saturated with buildings, homes, cars and other types of properties. All these things have one thing in common: they are all surrounded by trees. Residents of Asheville and Buncombe County, NC are a part of this matrix. Because the fabric of our society has changed over time, in most instances, trees just stand up and look pretty. However, just like people, they too can get ill. Sometimes, they may die. In either instance, it may be best to cut them down. If you experience such severe issues with your tree, call Family Tree Services today. Trees that receive regular care and maintenance are expected to stand tall for decades. However, due to forces beyond our control, sometimes trees are unable to be sustained and need to be cut down. Dead trees and dying trees are the most common reasons for felling. When a tree becomes diseased or gets severely damaged in a storm, it may need to be cut down if trimming and pruning methods are not beneficial. Sometimes a tree may partially fall and become entangled on a nearby tree. This situation presents immense safety concerns. As a result, tree removal should be performed as soon as possible. If you require tree removal services in Buncombe County, it is always a bad idea to grab a chainsaw or ax and begin cutting. The proper planning, collecting of tools, pre-inspection and even first aid equipment are all things to consider before the first cut is ever made. A trained tree feller knows that a lot of preparation goes into cutting down a tree. Depending on the location of the tree, it is imperative that one be on the lookout for power lines, buildings and roads that the tree could fall on. If the tree is being cut down in a populated area, displaying warning signs is a must. One of the initial steps in planning to cut down a tree is to check the degree to which the tree is leaning. A tree feller with Family Tree Services will be equipped with the necessary tools to conclude how much the tree is leaning and in what direction. Noticeable deficiencies in the structure of the tree indicate an increased risk. For instance, spiraling bark on a tree is a direct indication that the wood on the inside of the tree is also spiraled. Therefore, it may be challenging or impossible to regulate the direction of the fall. The next aspect that must be taken into consideration is the direction of the felling or “drop zone”. Wherever a tree feller decides that a tree will fall, they need to be 100% sure that there are no valuable hurdles in its path. The drop zone should be measured at a length that is double the height of the tree. Positioning is the key to preventing a catastrophe. However, it should always be assumed that a tree could fall in any direction. Therefore, multiple escape routes must be determined before tree cutting begins. The size of the tree will determine the tools that are needed for felling. If you are planning to cut down a small tree, you will not need the same types of tools that would be needed to cut down a large tree in the forest. 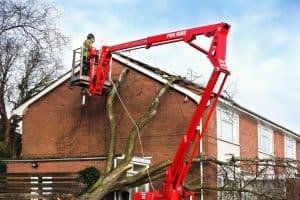 At Family Tree Services, we’ve done our homework on the proper techniques for tree removal for our Asheville, NC community. Be sure to call us so that the job can be done right the first time. You’ve probably heard different terms for tree cutters tossed around a lot. However, sometimes trees need specialized care. For focused tree care, Family Tree Services provides a tree surgeon! Unlike what the name implies, tree surgeons are not actual doctors. Their main role is to eliminate any struggles that occur between humans and trees. At the end of the day, ensuring the welfare of humans and their possessions is a top concern. When providing tree service, a tree surgeon must have full knowledge of how that tree works. Some of their job roles include performing tree examinations and risk calculations. These can determine the level of danger that a tree(s) may impose. Dead trees or dying trees can be effectively recognized by a surgeon so that the proper actions are taken. Surgeons also specialize in applying spray treatments to trees to prevent or fight diseases and pests. As you can see, the job of a surgeon is vast and ever-changing. However, there is no job that cannot be conquered by the surgeons at Family Tree Services. Let’s face the fact that life happens. Life also happens to trees. Trees are beautiful and full of uses until they become a threatening hazard. In these cases, emergency tree removal may be necessary. Don’t worry, Family Tree Services has your back! If you’ve ever witnessed an extreme weather related event, you know how a downed tree can immediately create a perilous situation. But, you can escape these types of situations before they ever happen. One of our constant mantras is to have dying or dead trees removed from your property before a bad storm can cause them to fall. If your tree is dying or dead, you should consider it a dire situation that’s worthy of emergency tree removal. Your next course of action to be to pick up the phone and call Family Tree Services today. We hope that you’ve gained a lot of insight on how we have taken the time to develop our knowledge of the science behind cutting down trees. Our company has your family and property at heart. Trees are our friends. They were put on this planet to aid in our survival. But, if that friendship ever becomes strained, be sure to call on your other friends at Family Tree Services.